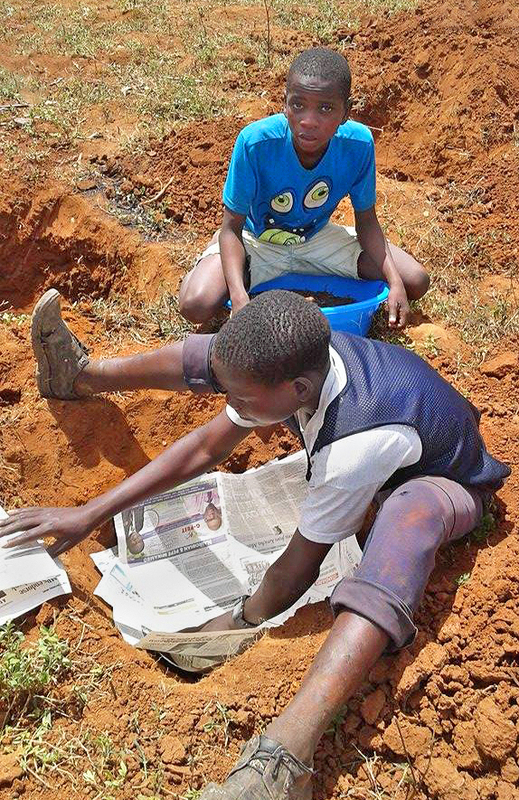 Making news paper Zai Holes in Kenya. Photo: Salim Shaban. Making news paper Zai holes in Kenya in Africa. 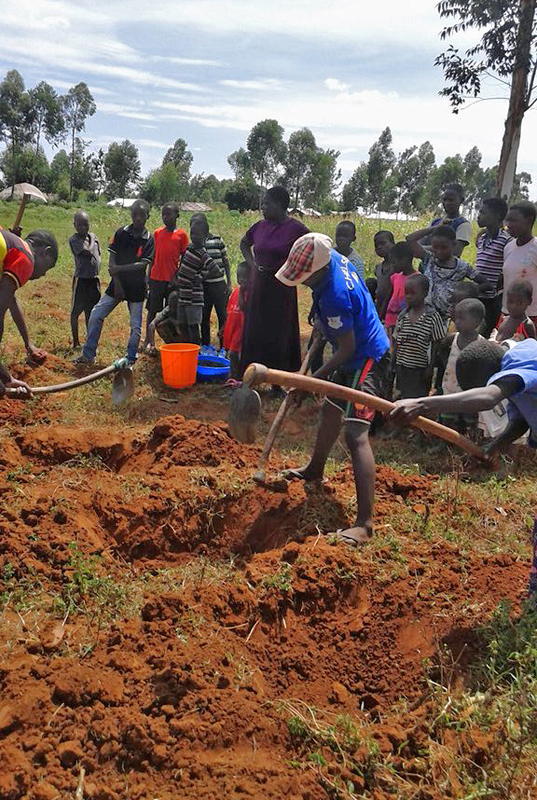 Some photos of a news paper Zai hole training session held by Pastor Salim Shaban with local school teachers and students in Kenya. All the photos were taken by Salim, and I have modified them slightly in Photoshop. 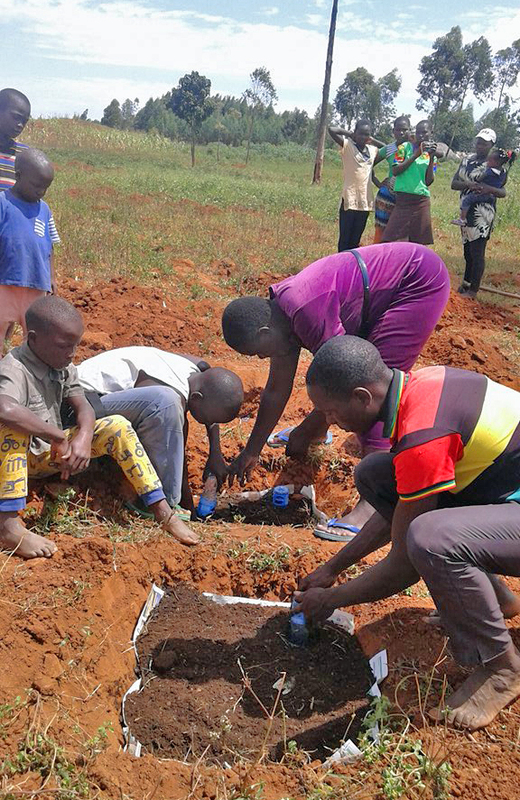 This training session follows a very successful experiment testing news paper Zai holes by Salim, where the yield of green beans increased by 300%. Hopefully more like this can be done to teach people how to make news paper Zai holes and Zai holes generally. Adults in the area have also expressed interest in being shown how to do this, and hopefully the technique will be widely adopted to the benefit of all the community, and further afield (hopefully worldwide). If you would like to support Salim in Kenya in any way in his wonderful and very worthwhile work and ministries, you can contact him by email: ctkbungoma@gmail.com. I have made some additional explanatory notes and suggestions, to try to make the Zai holes work as well as possible. 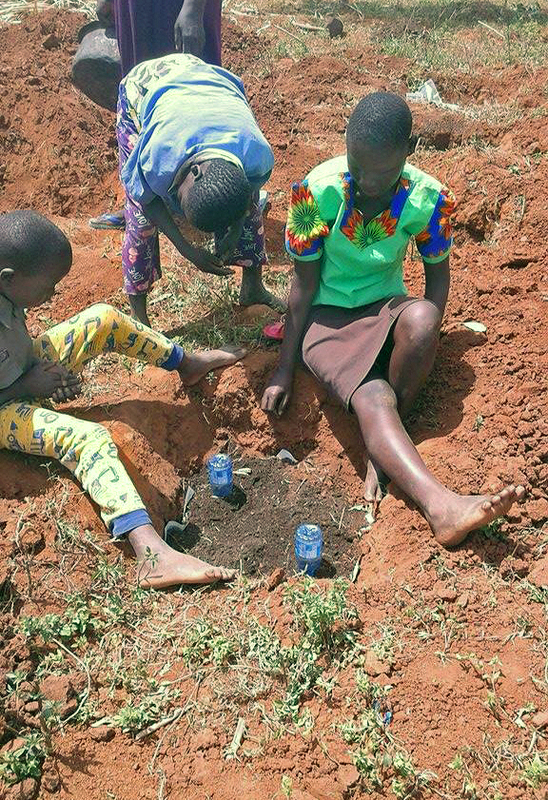 Students digging Zai holes in Kenya. Zai hole. Invented in Africa, the space up slope from the hole acts as a catchment for water which then flows into the hole (only really needed in dry climates). The soil in the hole is typically enriched with manure or compost (biochar and ash can also be added). The combination of improved soil and more water can result in huge growth increases for crops, vegetables, trees or other useful plants, especially in infertile soils with a hard surface crust, and dry climates or seasons. Invention: Yacouba Wadogo. Illustration: David Clode. News paper Zai hole. About 20 sheets of news paper at the base of the hole form a slowly permeable barrier. This theoretically holds water and nutrients in the root zone for longer, but not long enough to cause waterlogging, which could occur with an impermeable barrier such as black plastic. Roots of plants can grow within the hole and down to the newspaper (moist fertile zone), but also out into the surrounding soil for extra water and nutrients. In an experiment carried out by Salim Shaban in Kenya, bean yield was increased by 300% compared to Zai holes without news paper at the base. Invention and illustration: David Clode. 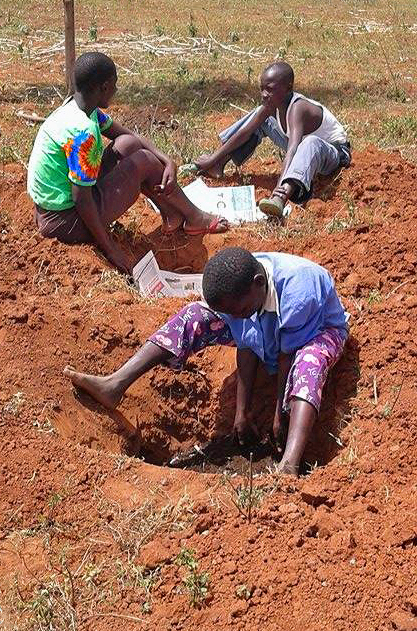 Digging Zai holes in Kenya with hoes. In this case hoes are the traditional tool for digging holes, but in sandy soils spades may be better, and in loamy and soft clay soils a garden fork my be better. It would be up to the individual and their preferred tool, or whatever tools may be available. Whatever is easiest and reduces the amount of physical work, especially for people who are not very strong, should be used. Where a hoe or spade has made a hard surface on the sides of the hole, these should be broken up with a pointy part of the spade or hoe, so that it is easy for roots to grow out into the surrounding soil. In heavy clay soils (like pottery clay), using a spade to dig a hole can result in glazed walls, which prevent water draining out, and can cause waterlogging and root rot which may kill the plant, as well as hindering root growth sideways out into the surrounding soil. This is especially important for trees. Materials at the ready for making news paper Zai holes. News paper, plastic bottles with holes in the sides (and the base still to be cut off), and chicken manure composted with biochar to be mixed with soil and then used to fill the holes. Trees and Zai holes. Note the young eucalyptus trees nearby. Tree roots commonly spread out to about two, to two and a half times the width of the canopy, and any closer than this and the tree roots may grow into the holes and use up water and nutrients, which means the crops won’t grow as well as they could. On the other hand, some types of trees can increase the productivity of crops grown beneath or next to them. 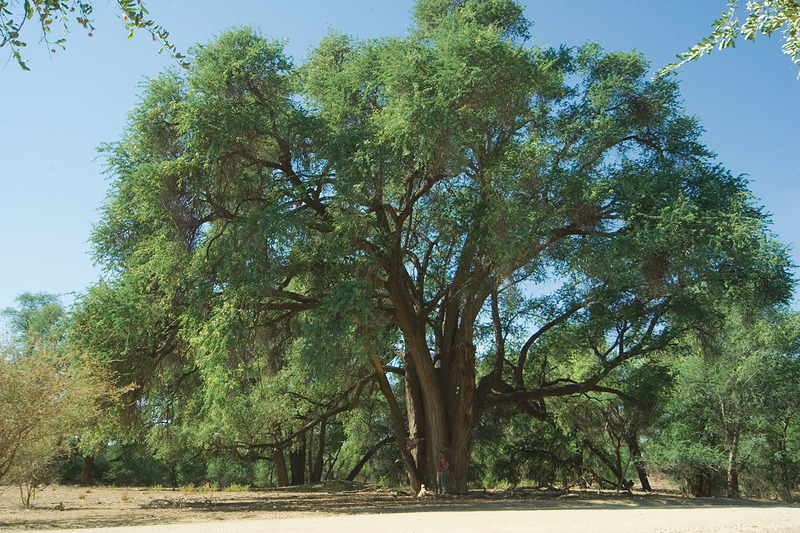 For example, Faidherbia albida in Africa (previously Acacia albida, Ana tree, Apple-ring Acacia), and Prosopis cinerea on the Indian subcontinent). I estimate that a combination of Faidherbia albida trees (at approximately 10 metre spacing) and news paper Zai holes would increase crop productivity by three to five times, or more, compared to a typical open ploughed field. 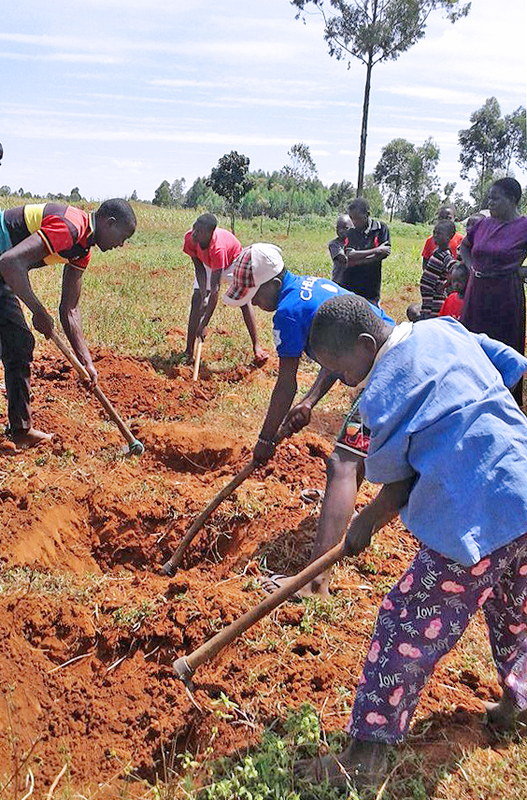 Complementary plant combinations in the Zai holes, such as maize and climbing beans, could also result in even more productivity. 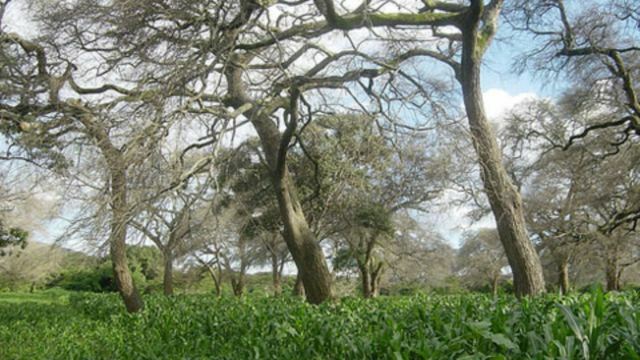 Maize grown under Faidherbia trees in Africa. Photo: learningenglish.voanews.com. Materials to make Zai holes ready to be used. News paper at the ready. News paper ready to be placed in the bottom of the Zai holes. Sun dried clay bowls could also work. Placing news paper at the base of the holes. 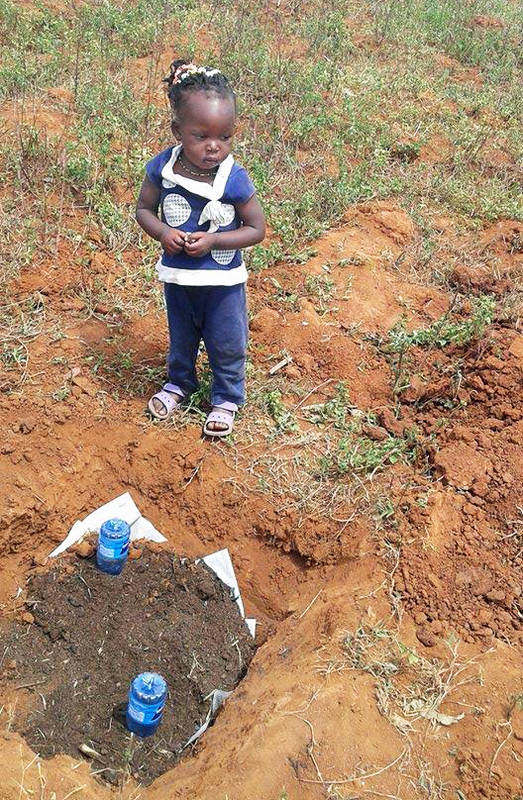 Making news paper Zai holes in Africa. Soil mix of chicken manure and biochar being used to fill the hole. Various manures and composts, including where available, wood ash, rock dusts, and if affordable, commercial fertilizers, can be used, and mixed with the soil and placed in the holes. 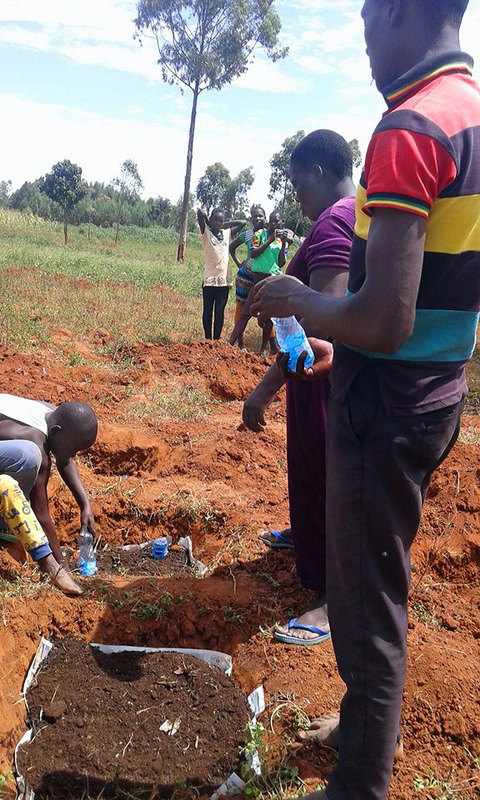 Adding water bottles for irrigation. Making Zai Holes in Kenya. Adding plastic water bottles (they need to have holes made in the sides for water to seep out, and the base cut off so they can be topped up with water as needed). Photo: Salim Shaban. Irrigation. The hole still needs needs to be thoroughly watered when all the soil mix is used to fill the hole. Crops can then be planted, with extra watering of the plants with a watering can with a sprinkling rose end, and then mulch added around the crop plants. Low rates of fertilizer could be mixed into the water, and this could be human or livestock urine as it is free and easily available (use about 10 – 20% urine). Other containers for watering through the growing period could be used, e.g., tin cans with holes in the base and sides, or clay pots. Whatever is free, or cheap and easily available. Plastic bottles could also be placed the other way around, with the mouth hole at the top. This may reduce evaporation losses, and fewer creatures would get trapped in the bottles (possibly insects, lizards, etc.). A stick placed in the bottle would help animals to get out, or the tops can be covered. Water should seep out into the soil fast enough not to cause a problem of providing breeding sites for disease-carrying mosquitoes. Plant spacing. 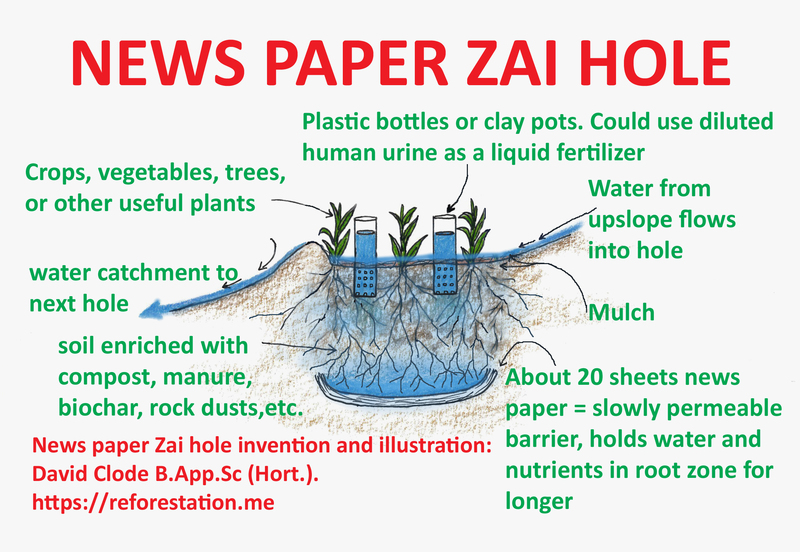 News paper zai holes, if well made and maintained, should provide crop plants with all the nutrients and water they need. This means that spacing of plants could be much closer than is typical of a ploughed field. In his book, “Organic Gardening” (a classic Australian text on the subject), Peter Bennet has a photo of fourteen maize plants crammed into a 30 cm diameter space of moist and very fertile soil, with every plant producing a good crop of maize cobs. I suspect that in a 30 cm diameter news paper Zai hole, 9 plants (3 rows of 3) or even 16 plants (4 rows of 4) could produce well. In a 45 cm or larger hole, 25 plants (5 rows of 5), or more, could work well. If the paths between the Zai holes are narrow, productivity should still be considerably greater than a ploughed field of the same size. Mulching the Zai holes and surrounding paths, which reduce weed growth, which would compete with the crop plants and reduce their growth, and to hold in moisture for longer, as well as maintain moderate soil temperatures which may promote the growth of beneficial soil life such as Mycorrhizal fungi. 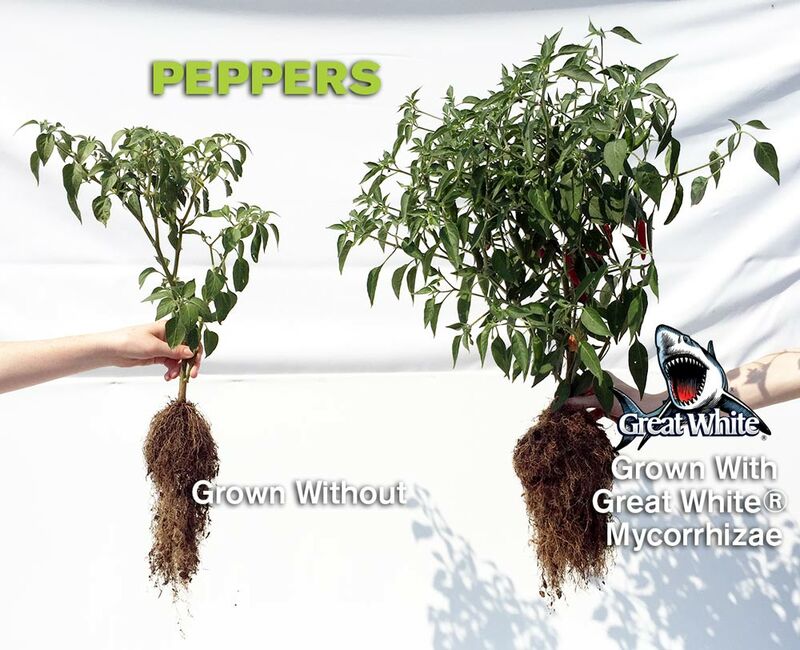 Pepper grown with mycorrhizal fungi. If the growth of mycorrhizal fungi and other beneficial soil life such as nitrogen-fixing bacteria can be promoted, the need for expensive fertilizers will be reduced, and good yields should still be obtained. The soil mix still needs to be built up higher so that roots can grow sideways into the surrounding soil for any extra nutrients and water they can get. All that is needed now is to plant the plants and water them in, followed by mulching around the plants. Then following this, the plants need to watered, fertilized and weeded throughout the growing season. Nitogen-fixing plants. 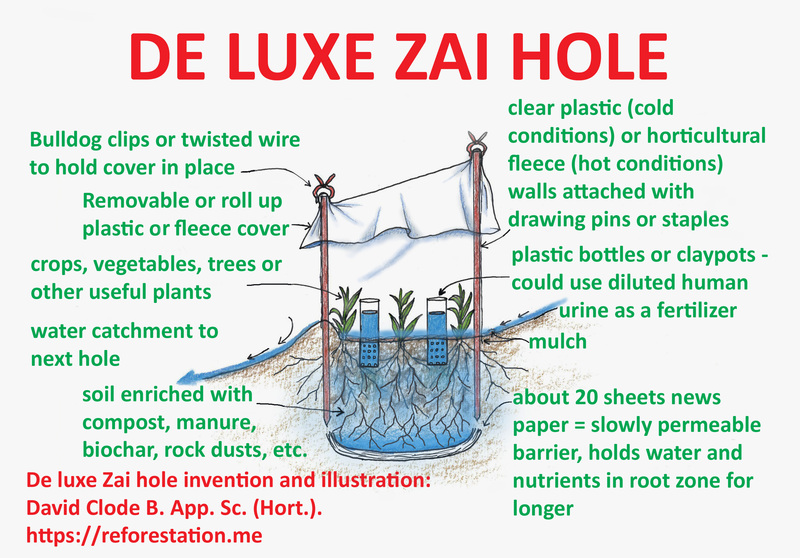 News paper Zai holes could also be used to grow nitrogen fixing plants or other plants to increase soil fertility, (crop rotation) and to provide fuel wood (and therefore biochar and ash), and mulch, fodder, or compost from the leaves, e.g. Sesbania species, Tithonia diversifolia (not nitrogen-fixing), Tephrosia species, Calliandra species, Acacia species, sun flowers (not nitrogen-fixing), etc. These could also add biodiversity and provide nectar for bees (for pollination, honey, and they may chase away marauding wildlife), and other beneficial insects. 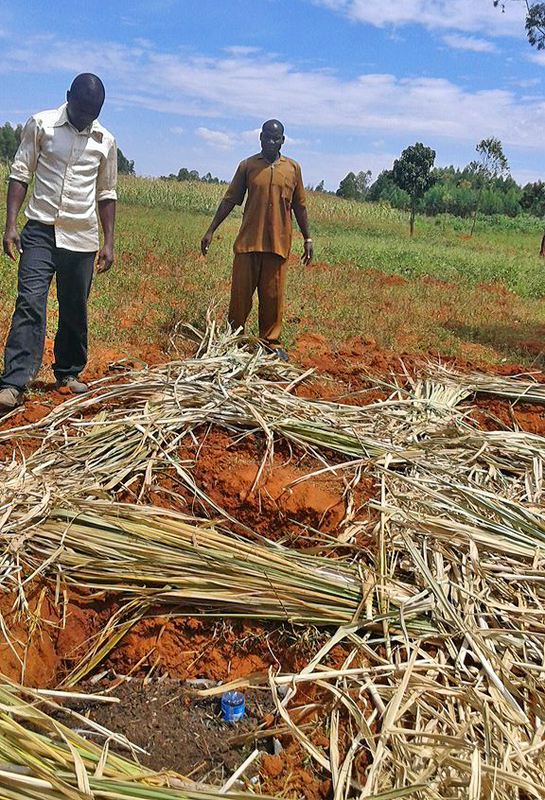 Fodder production for stall fed livestock. Grasses such as Napier (Cenchrus purpureus, previously Pennisetum purpureum) Gamba grass (Andropogon gayanus), and Guinea grass (Megathyrsus maximus, previously Panicum maximum) and others may be suitable. They could be combines with fodder legumes. Biodiversity. A variety of plants can be grown which add to biodiversity and may bring in beneficial pest controllers such as birds which eat insects and caterpillars. Perhaps aloes and other low maintenance flowering succulents, calliandras, grevilleas, melaleucas (callistemons), daisies, including possibly pyrethrum for making insecticide spray, tansy for beneficial insects, etc. Fuel wood. 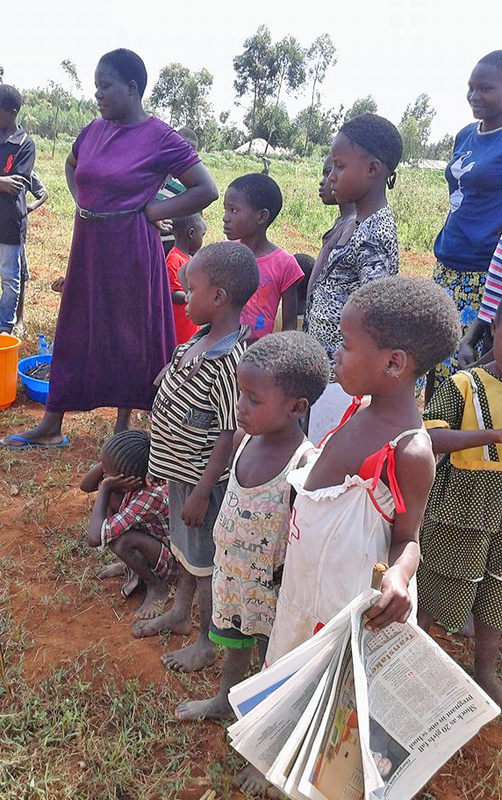 Plants can be grown in Zai holes to produce fuel wood for fuel efficient stoves. These in turn produce biochar and ash which can be added to the Zai holes. Some possible species: Calliandra species, Acacia holosericea, A,. crassicarpa, A. auriculaeformis, A.torulosa, Sesbania species, etc. De luxe Zai hole diagram. 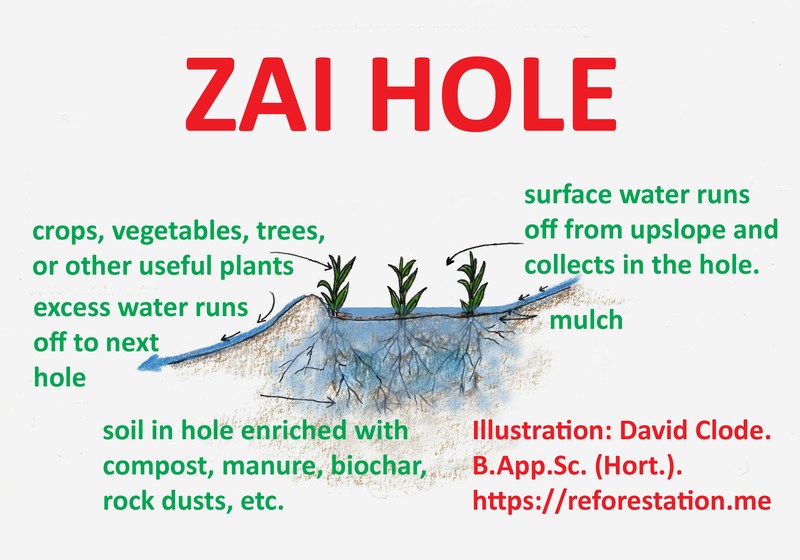 Zai holes can increase the growth of grains, vegetables and trees, especially in compacted infertile soils in drier climates or seasons. Additional modifications to increase productivity. De luxe Zai hole invention and illustration by David Clode. 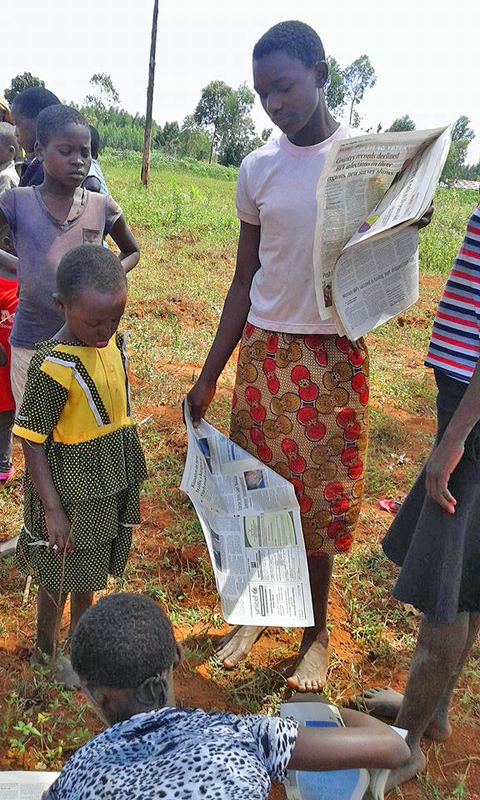 Making news paper Zai holes in Kenya. 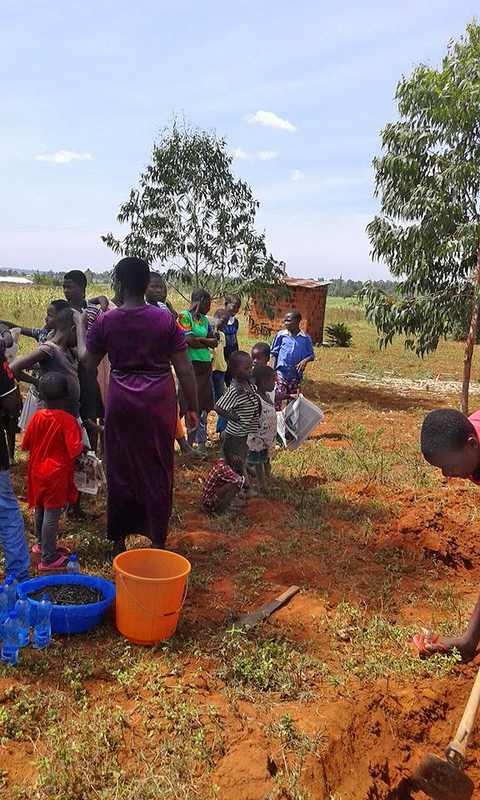 Making Zai holes requires some physical work and investment in materials initially, but usually results in more productivity, greater food security, and more nutritious food, in less space, for many years. “Little Helper”. 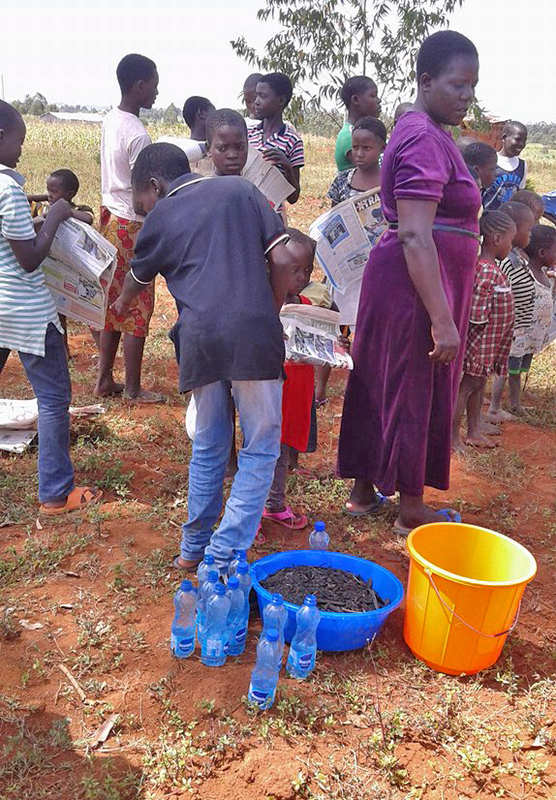 News paper Zai hole training project, Kenya. Photo: Salim Shaban. Combined with complementary trees, such as Faidherbia albida or Prosopis cinerea, productivity should be an estimated three to five times as much as a traditional ploughed field, and perhaps much more. and he who sows bountifully will also reap bountifully”.